It was the 1920s, and flapper-age fervor was in high gear in Gloucester, Massachusetts. It was fueled by illegal booze flowing into every cove and beach from rum row ships off-shore. With surface vessels from his Coast Guard station in the harbor outmatched, young Lieutenant Commander CC. Von Paulsen wanted to take to the air. 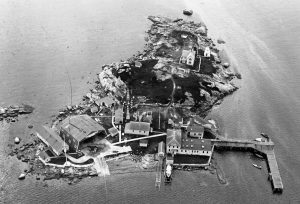 With encouragement from higher ups but no funding, he scrambled together a makeshift seaplane base in Gloucester harbor, sharing tiny Ten Pound Island with a lighthouse that had progressed from ramshackle to reputable, and a government fish hatchery. Von Paulsen borrowed a bi-wing seaplane from the Navy and, along with a fellow pilot, flew a relentless schedule of patrols, scanning thousands of miles of coastal waters to spot rum ships and radio his patrol boats to take up the chase. 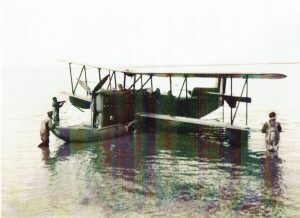 The results convinced hardened sea officers and Washington politicians that there was a role for the Coast Guard in the air. 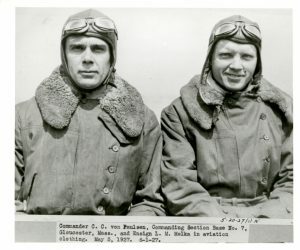 Von Paulsen was granted funding and more planes to expand his shoestring operation. Soon the waters off Cape Ann were free of mob-financed hooch delivery ships.